ELIZABETH PETROVICH is today’s winner in the March Madness Treasure Hunt. Elizabeth, you have won a Kindle copy of the fun novel Cupid’s Christmas. This is a story that is sure to get you smiling as you follow Cupid in his antics to bring lovers their perfect match. 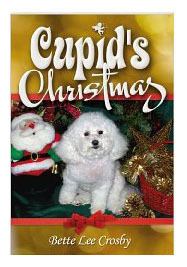 Cupid’s Christmas is a sweet story that can be enjoyed year-round. With over 100 reviews on Amazon, it has a rating of 4.6 out of a possible 5 stars, so I think you are going to enjoy it. And, I thought you might like to know a portion of the proceeds of this book are donated to a No-Kill Animal Rescue Center. Congratulations and thanks for entering. Congratulations Elizabeth. I have read Cupid’s Christmas and it is a touching story, one that will remiain in your heart for very long time to come. Congratulations Elizabeth. I read this book and found it funny reading about Cupid’s antics as he tries to play matchmaker. I think you will enjoy the story and may want to check out her other books if you haven’t read them. I find her writing to be excellent and she knows how to pull your heart strings.